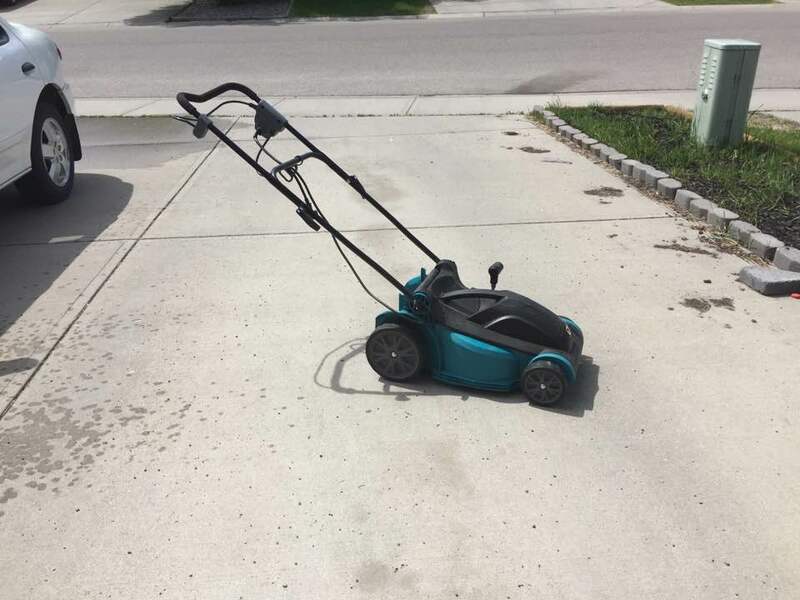 I shopped, bought and built our new lawnmower all on my own!! I went to mow my lawn on my usual Wednesday yard work day and I had forgotten to plug the battery in so I had to plug it in and wait until the following day to do it. Thursday morning I grabbed the battery out of the laundry room where I charge it and it was crazy hot and I couldn't get it to fit into the lawnmower. Greg told me to leave it alone since it was probably swollen from the heat. Later that day I tried again once it cooled down and it still wouldn't fit. Greg tried Friday morning when he was getting his bike out and said it was still swollen and we would need a new one. 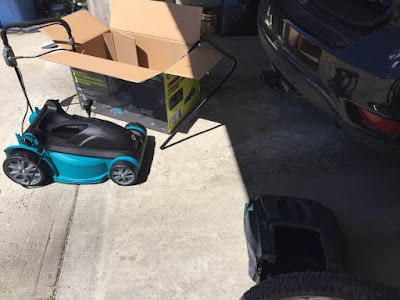 I was really annoyed because this battery operated lawnmower was only 2 years old and the one we had before this was also only 2 years old when we had to replace it and yes it was battery operated. We had purchased the latest one at Canadian Tire so I went online to see if I could find a replacement battery for it and the one that said would fit in my lawn mower with all the right specifications was actually more narrow then wide which would not fit. I did find one in store that looked like it would fit into mine but the voltage was too high and Greg said it wouldn't work. Plus it was the same price as the lawnmower I had found on sale so I wasn't too interested in it. 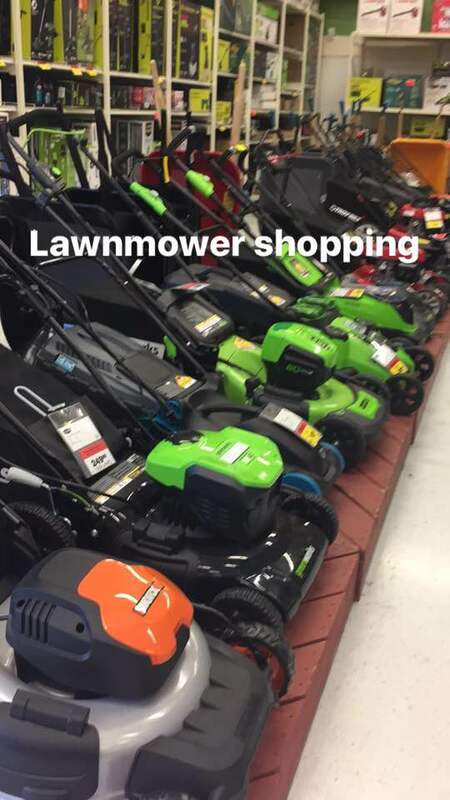 As much as I absolutely loved my battery operated lawn mower, I knew that I wasn't buying another one. They are much pricier then electric or gas versions and don't last nearly as long. 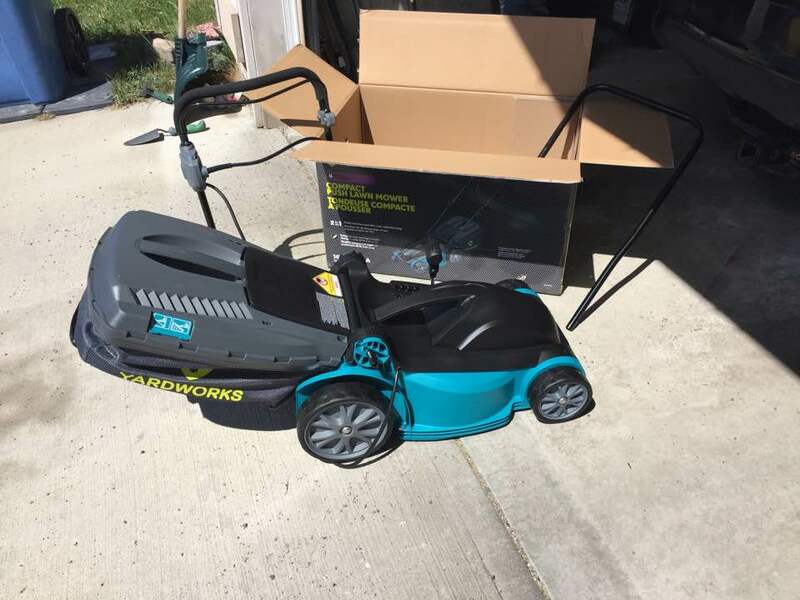 I didn't necessarily want the cheapest lawn mower but it had to be light and it had to be electric. I don't like the idea of storing gasoline in my garage so that was a definite deal breaker for us. Before bootcamp that morning I had looked at Walmart, Home Depot, Rona, Canadian Tire + Lowe's websites looking for the best deal. I narrowed it down between one from Canadian Tire and one from Lowes. Luckily for me, they are both in the same parking lot so easy to get from one to the other if necessary. I ended up liking the one at Canadian Tire and it was pretty light and it was a pretty colour haha. There was nobody around so I had to put the box into the cart all by myself. 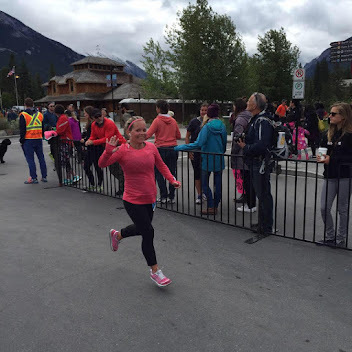 It was fairly light and I am fairly strong so I was able to make it work. It was a little harder getting it out of the cart though and into my journey but getting it out was ok. It was weird but I think it had something to do with the positioning of it in the cart since i had to lift up and then out. I don't know though, just guessing. 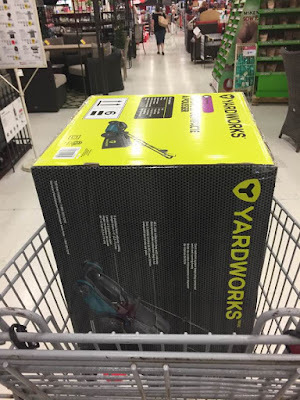 I was going to leave it at first for Greg to build but I really wanted to get the lawn done that day and not wait until the next day for it to be done since Finley had tech training that night. So I attempted to put it together on my own. I don't normally use a grass catcher on my lawn mowers because I like to mulch the grass once it is cut but I thought I would give it a try and it seemed pretty easy to put on. Unless of course you don't actually have it on, it just looks like it is haha. It only took about 20 minutes and my lawnmower was put together all by me. As you can see the grass catcher isn't on it and that is because as I was mowing my front lawn, I noticed that the cut grass was still on my lawn so I turned it off and unplugged it from the cord and looked at it. Turns out I had it partially attached but not all the way in or something like that. I took it off, threw it in my garage and there it stays haha. Ironically enough, I used the same cord on this one as I did on our first electric lawnmower when we bought the house 9 years ago. How do I know this? It has electrical tape covering up the areas that I ran it over hahaha. The lawnmower is much more powerful then my previous 2 and is really light. It is actually lighter then my battery operated one or at least very close. It is small and compact like my previous one and cuts really well. The cord is taking some getting used to but I have now used it 2x since I got it and I seem to be getting a routine so to speak down. Here's hoping it lasts longer then 2 years! !